and floor space, while maintaining cleaning-quality requirements. metal-stamping and contract insert-molding company. Weiss-Aug produces custom components for the automotive, medical, electronics and open-cavity-packaging markets. These include IV-catheter systems, ligature and surgical components, and automotive sensors for fuel, oxygen and gas-pedal assemblies, to be delivered “free of all foreign matter,” according to customer contracts. That stipulation includes cutting oil, often trapped in tiny holes where it can’t be seen. To maintain its high standards—less than 1 ppm and 97 percent on-time delivery—without increasing operating costs, the company recently replaced aqueous parts-cleaning machines that it had used for more than 10 years. Solvent systems were ruled out from the outset, due to previous experience and environmental concerns, but Weiss-Aug did evaluate chlorinated-solvent vapor systems, fluorohydrocarbons and other methods. Thorough analysis led the company to an environmentally friendly non-chlorinated hydrocarbon cleaning system rom German manufacturer Dürr Ecoclean—the 80C. Hydrocarbon cleaning, widely used in Europe due to strict environmental laws, has become more popular in North America. After outperforming every other process in extensive tests, according to Weiss-Aug officials, the 80C was installed in mid-2006 by Dürr Ecoclean’s U.S. operation based in Wixom, MI. It immediately achieved reductions of 70 percent or more in operating costs, cycle time and floor space. With the completely automated cleaning system, part batches arrive in baskets via conveyor and enter an enclosed chamber, where they are twice flooded with a nonhalogenated hydrocarbon fluid to remove oils, grease, emulsions or swarf. The parts are rotated and/or oscillated to ensure that cleaning fluid reaches all surfaces of every part. Also, a vacuum pump reduces pressure in the work chamber so that the cleaning fluid will flow into blind holes and cavities. 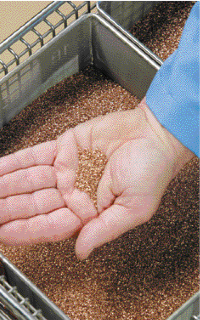 Vapor degreasing follows, then vacuum drying to vaporize the cleaning fluid and remove any remaining residue. Following the cleaning process, which takes only minutes, a conveyor carries parts out of the chamber for packaging. 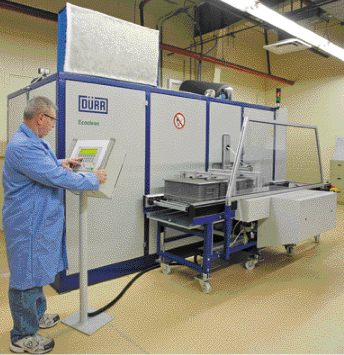 Weiss-Aug programs the system to clean stampings of various sizes, configurations and materials. Via the new system, the company typically cleans as many as 12 different small parts per day, ranging from 0.004 to 1.5 in. long. One medical component has an ID of only 0.0967 in., and Weiss-Aug’s IC contacts for PCB connectors are “like grains of sand,” according to Sheridan. Part materials include stainless steel, beryllium, copper, and copper- and nickel-based alloys. Although some cutting oils are thicker and more difficult to remove, the Dürr system removes them as efficiently as the thinner ones, according to company officials. Despite such variety, Weiss-Aug has found that all customers’ parts can be cleaned by one of the five programs entered into the system when it was originally installed. The machine can store as many as eight individual programs. The system stores programs that govern cleaning of precision stampings, including complete removal of cutting oil from these tiny IC contacts. Baskets carry parts into the cleaning chamber, where they are flooded with hydrocarbon fluid, followed by vapor degreasing and vacuum drying. Efficiency is another key factor in maintaining on-time deliveries. The hydrocarbon system boasts an 80 percent shorter cycle time than the aqueous systems it replaced, with an uptime of 97 percent across two shifts per day. In addition, note Weiss-Aug officials, little maintenance is required, with some of that accomplished without completely shutting down the machine. Adding to efficiency, Weiss-Aug recycles the cleaning fluid, collecting it with the cutting oil in an onboard distillation system. The mixture is heated to evaporate the cleaning fluid into vapor, which can be used for vapor degreasing or condensed into fresh cleaning fluid and reused. Meanwhile, the cutting oil automatically discharges to a 55-gal. waste drum. The hydrocarbon fluid —more economical than the aqueous solutions previously used—also gets recycled. This, along with the system’s energy efficiency and labor savings, adds to cost savings. The footprint of the Dürr system measures 13.5 by 5 ft., not including the load/unload conveyor. This opened up space for other operations and simplified moving the system into Weiss-Aug. Installation and startup was aided by the fact that the system’s performance had been pre-approved by customers based on test runs at Dürr’s Wixom facility. Though Weiss-Aug has been able to achieve significantly lower operating costs while maintaining quality and delivery commitments without environmental compromises, the best reason for employing the new cleaning system, according to Sheridan, was obvious. Information for this article provided by Durr Ecoclean, Inc., Wixom, MI; Tel. 248/960-4630; www.durr-ecoclean.com.